^ Final report on the accident on 1st June 2009 to the Airbus A330-203 registered F-GZCP operated by Air France flight AF 447 Rio de Janeiro - Paris (PDF): 202. ^ Plane Crash Info. [2011-10-23]. ^ Search intensifies for vanished Air France flight. ABS–CBN Corporation. Agence France-Presse. 2009-06-02 [2011-06-02]. （原始内容存档于2011-06-14）. ^ ASN Aviation Safety Database. Flight Safety Foundation. 2013 [2013-12-26]. ^ Interim report on the accident on 1 June 2009 to the Airbus A330-203 registered F-GZCP operated by Air France flight AF 447 Rio de Janeiro – Paris (PDF). Paris: Bureau d'Enquêtes et d'Analyses pour la sécurité de l'aviation civile (BEA). 2009-07-02 [2009-07-04]. (Original French version). ^ Flight AF 447 on 1st June 2009. BEA. 2011 [2011-06-02]. ^ 9.0 9.1 Final report on the accident on 1st June 2009 to the Airbus A330-203 registered F-GZCP operated by Air France flight AF 447 Rio de Janeiro – Paris (PDF). BEA: 217. July 2012. ^ Briefing. BEA. 2012-07-05 [2013-02-24]. ^ Clark, Nicola. Report on Air France Crash Points to Pilot Training Issues. The New York Times. 2011-07-29. ^ Press release N° 5 (新闻稿). Air France. 2009-06-01 [2011-01-08]. （原始内容存档于2011-01-04）. ^ Air France Update. Flight Air France 447 Rio de Janeiro – Paris-Charles de Gaulle. Air France. 2009-10-05 [2011-01-08]. ^ Ships head for area where airplane debris spotted. CNN. 2009-06-02 [2009-06-02]. （原始内容存档于2009-06-06）. ^ Air France pays $24,500 to crash victims' families. CNN. 2009-06-02. ^ Safety Investigation Following the Accident on 1st June 2009 to the Airbus A300-203, Flight AF 447 – Summary (PDF). BEA. July 2012. ^ BEA final report, section 2.1.2.3 "The excessive amplitude of these [nose-up] inputs made them unsuitable and incompatible with the recommended aeroplane handling practices for high altitude flight." ^ Palmer, p. 7 "02:11:07 [...] The last of the pitot icing had cleared and all three airspeed indications were then displaying correctly"
^ Palmer, p. 57 "The pitot icing lasted for about one minute and five seconds". ^ BEA final report, p. 198 "The speed displayed on the left PFD was incorrect for 29 seconds, that of the speed on the ISIS for 54 seconds and the speed displayed on the right PFD for 61 seconds at most." ^ Palmer, p. 57. "This created a situation where the air was pushing into, in addition to flowing over, the static ports. [...] This dynamic accounts for the repeated falling of the airspeed to invalid values." ^ Recording Indicates Pilot Wasn't In Cockpit During Critical Phase. 2011-05-23. ^ Flight AF 447 on 1st June 2009, A330-203, registered F-GZCP, 27 May 2011 briefing. BEA. ^ Section 1.9.2 "Coordination between the control centres", First interim report, BEA . ^ Premières précisions sur l'Airbus d'Air France disparu [First information about the disappeared Air France Airbus]. L'Express. 2009-06-01 [2009-06-01]. （原始内容存档于2009-06-05） （法语）. ^ AF 447 may have come apart before crash: experts. Associated Press. 2009-06-03 [2009-06-03]. （原始内容存档于2009-06-06）. ^ 存档副本 ‘Aucun espoir’ pour le vol Rio-Paris d'Air France [‘No hope’ for the Air France Rio – Paris flight]. L'Express. 2009-06-01 [2009-06-01]. （原始内容存档于2009-06-05） （法语）. ^ Williams, David. Air France 'loses hope' after plane drops off the radar en route from Brazil to Paris with 228 people on board. Daily Mail (UK). 2009-06-01 [2009-06-01]. （原始内容存档于2009-06-08）. ^ Chrisafis, Angelique. French plane crashed over Atlantic. The Guardian (UK). 2009-06-01 [2009-06-01]. （原始内容存档于2009-06-11）. ^ Prospect slim of finding plane survivors. KKTV-TV. Associated Press. 2009-06-01 [2011-02-16]. ^ Brazilian Air Force Bulletin (6). 2009-06-02 （葡萄牙语）. ^ Negroni, Christine. France and Brazil Press Search for Missing Plane. The New York Times. 2009-06-02 [2009-06-02]. （原始内容存档于2009-06-06）. ^ No survivors found in wreckage of Air France jet, official says. CNN. 2009-06-02 [2009-06-02]. （原始内容存档于2009-06-06）. 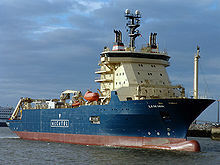 ^ 44.0 44.1 Ocean search finds plane debris. BBC. 2009-06-02 [2009-06-02]. （原始内容存档于2009-06-03）. ^ José Alencar decreta três dias de luto oficial por vítimas do Airbus [José Alencar decrees three days official mourning for Airbus victims]. Globo. 2009-06-02 [2009-06-02]. （原始内容存档于2009-06-12） （葡萄牙语）. ^ Sá, Evaristo. Navy ships seek to recover Air France crash debris. Agence France-Presse. 2009-06-03. ^ Mini-subs sent to look for jet. News24. 2009-06-02 [2009-06-02]. （原始内容存档于2010-01-17）. ^ Section 1.16.1.1 "Context of the searches", First interim report, BEA . ^ France 2. [2009-06-06]. （原始内容 (video)存档于2009-07-06） （法语）. ^ Joint aircraft system/component code table and definitions (PDF). Federal Aviation Administration, USA. [2009-06-06]. 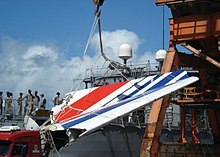 ^ Crash: Air France A332 over Atlantic on 1 June 2009, aircraft lost. Aviation Herald. 2009-06-02. ^ Airbus Flight Control Laws. Airbus. [2009-06-03]. ^ Avionics Product Range. Airbus. [2011-08-21]. ^ Press Release 17: Information on Searches of the Air France Flight 447. Brazilian Ministry of Defense. 2009-06-06 [2013-11-17]. ^ Bodies 'found' from missing plane. BBC News. 2009-06-06 [2009-06-06]. （原始内容存档于2009-06-08）. ^ Brazil: Bodies found near Air France crash site. MSNBC. 2009-06-06 [2009-06-06]. （原始内容存档于2009-06-07）. ^ Air France tail section recovered. BBC News. 2009-06-08 [2010-01-01]. ^ 58.0 58.1 Press Release 39: Information on Searches of the Air France Flight 447. Brazilian Ministry of Defense. 2009-06-22 [2013-11-17]. ^ Press Release 37: Information on Searches of the Air France Flight 447. Brazilian Ministry of Defense. 2009-06-20 [2013-11-17]. ^ Press Release 31: Information on Searches of the Air France Flight 447. Brazilian Ministry of Defense. 2009-06-14 [2013-11-17]. ^ France sends nuclear sub to hunt for jet wreckage. CBC News. 2009-06-05 [2009-06-09]. （原始内容存档于2009-06-08）. ^ Lost jet data 'may not be found'. BBC. 2009-06-03 [2009-06-03]. （原始内容存档于2009-06-04）. ^ Campbell, Matthew; Richard Woods. Crash jet 'split in two at high altitude'. The Times (UK). 2009-06-14 [2009-06-14]. ^ Note 33: Information on Searches of the Air France Flight 447. Brazilian Ministry of Defense. 2009-06-16 [2009-06-17]. （原始内容存档于2009-06-20）. ^ BEA second interim report, section 1.13, page 32 (PDF page 33 of 104) "The autopsies made it possible to identify fifty persons: 45 passengers, 4 flight attendants, and the captain"
^ Bremner, Charles; Tedmanson, Sophie. Hopes of finding Air France Airbus black boxes dashed. The Times (London). 2009-06-23 [2010-04-23]. ^ INFO FIGARO – AF 447 : le corps du pilote identifié. Le Figaro (France). 2009-06-25 （法语）. ^ Investigators say they have no confirmed black-box signals. France 24.com. 2009-06-27 [2009-06-23]. （原始内容存档于2009-06-26）. ^ Willsher, Kim. Air France plane crash victims found after two-year search. The Guardian (London). 2011-04-04. ^ Bodies found in Atlantic jet crash wreckage. Reuters. 2011-04-04 [2011-04-05]. ^ Solid-State FDR System including Crash Survivable Memory Unit (CSMU) (PDF). [2011-04-27]. ^ Memory unit from the Flight Data Recorder (FDR) – Photos. [2011-05-01]. ^ France starts recovery of bodies from Rio-Paris crash. Breitbart. 2011-05-05 [2011-05-05]. （原始内容存档于2011-06-13）. ^ Frost, Laurence; Andrea Rothman. Air France Victim's Body Recovered. Bloomberg News (Bloomberg). 2011-05-05 [2011-05-05]. ^ Vandoorne, Saskya. Air France crash recovery ends with 74 bodies missing. CNN. 2011-06-08 [2011-06-08]. ^ Vasquez, Tim. Air France Flight 447: A detailed meteorological analysis. 2009-06-03. ^ Air France Flight #447: did weather play a role in the accident?. Cooperative Institute for Meteorological Satellite Studies. 2009-06-01. ^ A Meteosat-9 infrared satellite image. BBC News. [2010-01-01]. ^ Plane Vanished in Region Known for Huge Storms. Fox News Channel. 2009-06-03 [2014-03-22]. （原始内容存档于2012-10-22）. ^ AF 445 statt AF 447: Air France ändert Flugnummer auf der tragischen Unglücksroute. Baseler Zeitung. 2009-06-08 [2009-06-08]. （原始内容存档于2009-06-12）. ^ The Aviation Herald. "". Retrieved 30 November 2009. ^ "Flight AF445 Rio-Paris-CDG on 29 November 2009." Air France. Archived 22 July 2010.